If we take contemporary theatre as our guide, honesty is only achieved among the white and privileged when they’re sitting down to dinner. 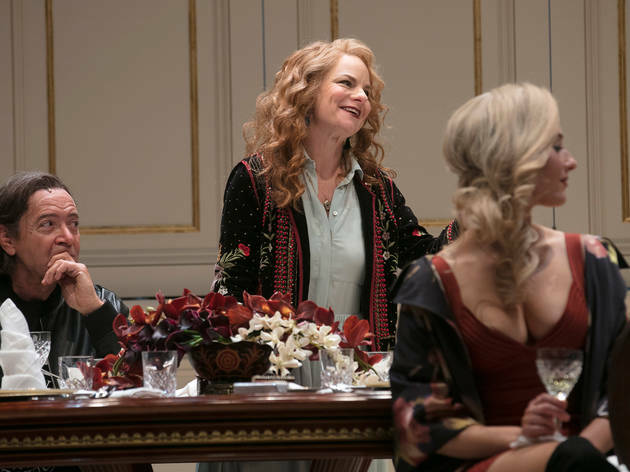 Family and social dramas frequently revolve around the dinner table, where meals go bad and secrets are revealed: think August: Osage County, Disgraced, and the works of Alan Ayckbourn. 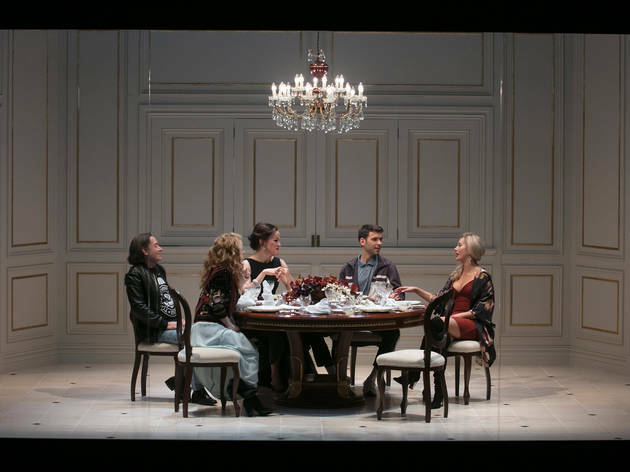 If you’re a regular theatregoer, chances are you’ve seen a dinner party play in recent memory. Dinner puts the dramatic in ‘dramatic dinner play’. Written by Moira Buffini and directed by Imara Savage (who directed dinner parties in Hay Fever and After Dinner, also for Sydney Theatre Company), it’s a tense but not particularly novel take on the genre. The host of the party and centre of the action is Paige (Caroline Brazier), an embarrassingly rich woman who does little else but arrange lavish dinners; she laughs at the suggestion that she might ‘do’ something, like have an occupation, but it’s a brittle laugh. It’s clear she has grievances to air, and that she will air them tonight. The party is ostensibly in honour of her husband Lars (Sean O’Shea) and his new best-selling pop-philosophy book Beyond Belief, but there’s not a lot of love left in Lars and Paige’s marriage. That may be partly to do with their guest Wynne (Rebecca Massey), a long-time friend of Lars with whom he is having an affair. Hal (Brandon Burke), a friend of the couple, is also on the guest list. Paige was close with his ex-wife, but Hal has brought his new wife Siân (Claire Lovering), a celebrity newscaster who is clearly bored with being mistaken for a pretty prop. The party – laced from the beginning with Paige’s carefully placed barbs – takes an unexpected turn when Mike (Aleks Mikić) turns up at the door after crashing his van into a ditch. In short order he becomes the final guest at the table, and his working-class roots provide some contrast to the privilege each of the other characters enjoy. Brazier is all dark fury and composure as Paige. It’s clear from early on that she’s cooked up more than the menu (including the dishes Primordial Soup, Apocalypse of Lobster, and Frozen Waste) with the waiter (Bruce Spence) who she hired online. 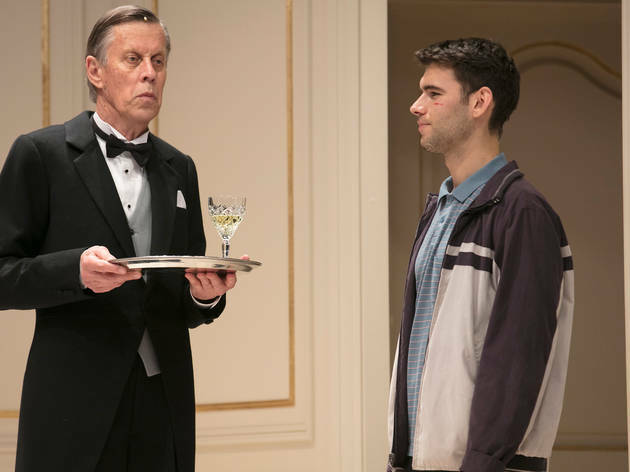 O’Shea’s Lars is just self-absorbed enough to be funny, and as Wynne, Massey captures a particular kind of open-hearted need that’s both messy and charming. Lovering’s Siân is particularly compelling – languid and discontent, she finally lights up for the ‘Apocalypse of Lobster’ course, where guests must choose between killing their own lobster or setting it free (she boils hers, with gusto). Burke, Mikić, and Spence deliver strong support. 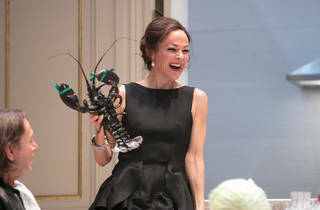 Elizabeth Gadsby’s highly stylised set design confines the action within a small wedge of dining room, behind a glass wall; like fish in a tank, the actors glide to and from the table, and the effect dulls the sharp edge of each conflict – it’s so far removed from us that we can’t quite buy into it. 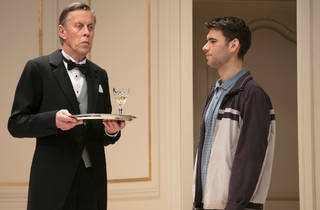 Max Lyandvert’s sound design is a key force in shaping the tension onstage: when the characters freeze dramatically over a discordant musical sting, the production dips pleasingly into the bizarre (though when the sound of an airplane overhead drowns out long descriptions of the food for laughs, it’s less successful – it’s hard to imagine an estate this grand located directly under a flight path). Savage plays fast and loose with realism elsewhere, too: at one point, a lighting rig is wheeled across the front of the stage by a black-clad crew member – to add a little more depth to the play’s suggestion that upper class society is mostly theatrics. But – as the laughter from the opening night audience will attest – Dinner is funny. And the cast clearly relish the freedom to create larger-than-life performances, and embrace the darker edges of Buffini’s comedy. It’s just as well, because the material itself is in danger of being too familiar; even the late-stage twist in the script is not as surprising as the playwright probably wants it to be. 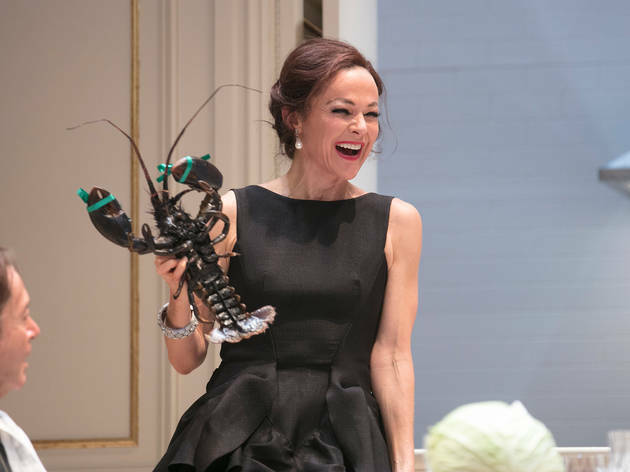 The biggest threat to the drama of this play, however, is its subject matter: it’s hard to feel strongly about upper class malaise.